Metro Weekly Flyer Thu Sep 7 – Wed Sep 13, 2017. 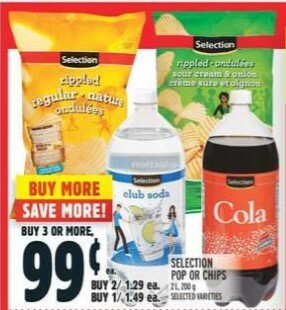 Buy more save more for Selection Pop Or Chips - On Price $1.49 Selected varieties. 2 L. Buy more save more! Buy 3 or more, $0.99, Buy 2/$1.29. 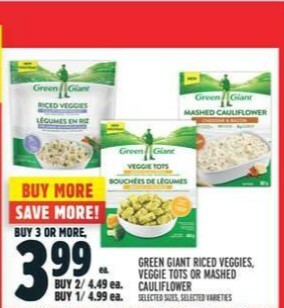 Green Giant Riced Veggies, Veggie Tots Or Mashed Cauliflower $4.99 - On Price Selected varieties. Selected sizes. Buy more save more! Buy 3 or more, $3.99, Buy 2/$4.49. 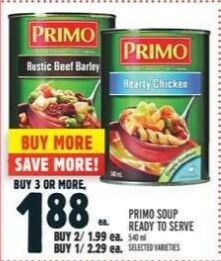 Primo Soup Ready To Serve $2.29 - On Price Selected varieties. 540 ml. Buy more save more! Buy 3 or more, $1.88, Buy 2/$1.99. 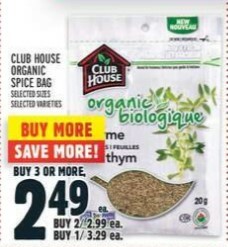 Club House Organic Spice Bag $3.29 - On Price Selected varieties. Selected sizes. Buy more save more! Buy 3 or more, $2.49, Buy 2/$2.99. 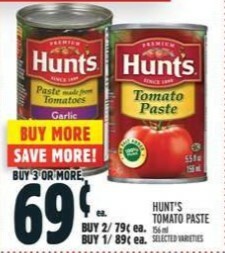 Hunt's Tomato Paste $0.89 - On Price Selected varieties. 156 ml. Buy more save more! Buy 3 or more, $0.69, Buy 2/$0.79. 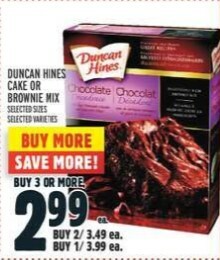 Duncan Hines Cake Or Brownie Mix $3.99 - On Price Selected varieties. Selected sizes. Buy more save more! Buy 3 or more Buy 3 or more, $2.99, Buy 2/$3.49. 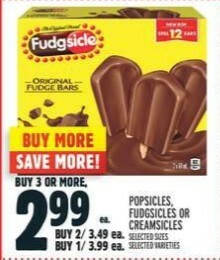 Popsicles, Fudgsicles Or Creamsicles $3.99 - On Price Selected varieties. Selected sizes. Buy more save more! Buy 3 or more, $2.99, Buy 2/$3.49. Selection Carbonated Spring Water $0.99 - On Price Selected varieties. 1 L. Buy more save more! Buy 3 or more, $0.77, Buy 2/$0.88. Iogo Nomad Drinkable Yogurt $1.19 - On Price Selected varieties. 200 ml. Buy more save more! Buy 3 or more $0.89, Buy 2/$1.00. Hershey's Or Neilson Milk Shake $1.99 - On Price Selected varieties. 310-350 ml. 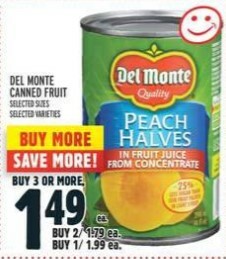 Buy more save more!, $1.49, Buy 2/$1.79. Selection Garbage Bags $4.49 - On Price Selected varieties. 20-40 un. Buy moresave more! Buy 3 or more $3.49, Buy 2/$3.99. Fancy Feast Hors D' Oeuvre $1.69 - On Price Selected varieties. 57 g. Buy more save more! Buy 3 or more $1.29, Buy 2/$1.49. Cesar Dog Food $1.09 - On Price Selected varieties. 100 g. But more save more! buy 5 or more $0.89, Buy 3/$0.99. Beggin' Strips Dog Treats $3.49 - On Price Selected varieties. 170 g. Buy more save more! Buy 3 or more $2.99, Buy 2/$3.29. Pedigree Dog Food $6.99 - On Price Selected varieties. 1.6-2 kg. Pedigree Dog Treats $4.49 - On Price Selected varieties. 130-737 g.
Cesar Or Pedigree Treats For Dogs $2.99 - On Price Selected varieties. 40-180 g.
Cesar Dry Food For Dogs $8.99 - On Price Selected varieties. 1.6 kg. You can click here Metro Flyer Canada for more details. Metro Weekly Flyer health and glow baby products on sale this week Huggies Training Pants $14.99 Sale Price $6.00 Savings Selected varieties. 20-42 un. Similac Baby Formula $26.88 Sale Price $6.11 Savings Selected varieties. 658 g. Vaseline Petroleum Jelly Or Q-Tips $3.49 Sale Price Up to $1.50 Savings Selected varieties. 375 g, 400 un. Axe Or Garnier Whole Blends Hair Care $3.99 Sale Price Up to $3.50 Savings Selected varieties. 355-370 ml.